The book we are going to introduce here is about the last fifteen years of work by Ines Fontenla, Argentine artist and naturalized Italian. The volume is not built with a chronological order, but with the areas that we find in her work: the imaginary utopia and territories, the migration and social conflicts and the one linked to the environment and nature. We are faced with a complex personality, which needs a long time of reflection and gestation. Through her work she does not provide answers or harsh certainties but rather, questions, underlying a deep anxiety. Her existential and artistic attitude is anti-dogmatic, inherently doubtful. The choice to work on the topics we have just mentioned is closely related to this, in close relationship with our complex contemporary world. The works of Ines Fontenla have all a more or less obvious autobiographical reference. They take into account her status as “migrant” from Latin America, where her family in the distant past had come from Europe, where she returned as an adult to live. Her relationship with her country of origin, however, is profound. She still spends a lot of time living and working in Buenos Aires. Fontenla sets out in search of the meaning of things, of what surrounds her, the macro phenomena, but also the micro realities of everyday life. In her research, you feel a continuous dichotomy, where doubts are certainly more than certainties. How are your works born? Through my work I try to interpret reality, to embrace it in its entirety. The image is born thanks to this process of understanding. In many cases it arises from reading an article that draws my attention. Just a significant phrase can stimulate in me a kind of reflexive uneasiness that motivates me to do research in order to be able to make sense of what I’m doing. A search that is not only artistic in its nature, on the contrary. Most often it is a journey of knowledge, covering various fields. Let’s start to get into your work. Let’s talk about the theme of utopia, so present over time. Let’s start with At the end of Utopias, the large installation that you have made in the Laboratory Museum of the La Sapienza University of Rome, the city where you live when you are in Italy. In that work of 2002 I wanted to represent different utopias over time and precisely Plato’s Atlantis, Sforzinda of Filarete, The Thomas More’s Utopia, The City of the Sun by Tommaso Campanella, the Falansterio by Charles Fourier, Etienne Cabet’s Icaria. Each of them was in a state of gestation, under construction or destruction? It is unknown. In a video you could see hands working with the pieces of architecture. There is a background of deliberate ambiguity, which allows an open reading. It is a kind of obsession, where you cannot distinguish the starting and the ending moment. As far as I can understand You have come to the concept of utopia starting from literature. I have been commissioned a work in a private home, and I have worked on it starting from the Memoirs of Hadrian by Marguerite Yourcenar. I tried to restore an image of the account of the Belgian author. Producing images is something very natural for me. I can state that I think by images. Whenever I read or hear something that strikes me, my thoughts immediately display it. Later of course I feel the need to deepen, to enrich, as I said, through research. It seems to me that architecture plays an important role in your work. There is often the concept of construction related to deconstruction. But also the design, the project in an open reading frame in which everyone can find a different meaning. Often in your work there are temples, the primitive time of architecture. I find Project of 2004 very fascinating in which the design project is supported by a sort of collapse. As in Past and Future of 2004. The temple is like a mental construction. In architecture there is the metaphor of the building which is crucial for me. Construction which also includes the idea of destruction which is equally important, both deeply linked to the concept of time. I’ve always been attracted by the buildings that collapse, by the actual rubble. Several times I wonder about this attraction of mine. I think that the answer can be found in my deepest subconscious. Even as a teenager I felt the sense of the fall as something very deep, I tried to exorcise it through my work as an artist. Mentioning rubble we would like to talk about one of your works which is particularly intense, realised in 2009, on the occasion of the twentieth anniversary of the fall of the Berlin Wall, from which its title is taken. The luminous sign with the name of the city is here divided into two different parts, one is hanging on the wall, the other collapsed in the rubble placed under the work. Here as well I leave the viewer free to think what he wants. Taking a step back tell us about Atlantis, the work you’ve done in the gallery of Pino Casagrande in Rome, in 1999. After working on literary texts I went to Plato, he has provided several interpretations of Atlantis. I was however interested in the concept of city, of ideal society of utopian matrix. Plato reflects on the corrupted Athens of the time where he happened to live as in The Republic, and in this sense he speaks of Atlantis. But this is not the place to talk about philosophy, nor I am up to it. Nevertheless I seem to find an interesting parallelism with our time. I find an interesting parallelism too. I am fascinated by the modernity of this thought. Through Atlantis I could work on a dichotomy that fascinates me so much, the one between real and virtual. We are living in a world where the boundary between the one and the other is extremely blurred. In reality Atlantis is just the product of a fine thought. To represent it I made an installation of sand that can be destroyed at any moment. Inside the tunnel, behind the large installation a large colonnade could be seen. A large photographic image on which two real columns were placed. Here too, the real and its representation. On a column there was the map of Atlantis as Plato represented it and on the other the text on the Solomon’s House by the English philosopher Francis Bacon, taken from his unfinished work The New Atlantis of 1612. The population of the house “He knows many things about the nations of the world, but no one knows them.” (unofficial translation) I am interested in the concept of personal enrichment through travel. Here too, the autobiographical dimension. You often use the form of an installation for your works through media which are widely different among them. The installation allows the viewer to fully immerse himself in the work, an aspect that particularly interests me. I like that my work can be experienced from within and not perceived as an imposition. I would always give life to works that cannot be contained, but that are able to contain. And again you also realized Island of Utopia by Thomas More, where you bring back maps, texts. A way to work you’ve made yours over the years. There is also here the concept of metaphor, that belongs to me, like also the myth. They both put us into a profound dimension, that of the unconscious. They help us to read the messages that we are given. They are like a kind of Ariadne’s thread. Metaphors offer a reading that goes beyond the visible, transcending the image. The myths, on the other hand, are able to carry the mind in the territory of existential issues, beyond a strictly temporary dimension. I am very interested in working on the present, which is profoundly different from today. The today idea conjures up a concept of an instant, transient temporality. On the contrary, the present projects itself into the future with one foot in the past. It provides us a broader and deeper vision of phenomena. I found myself several times talking about all this with the argentinian intellectual of italian origin, Norberto Griffa, who sadly passed away. Griffa made a clear analysis of my work, tracking two focal points of the same: the myth as an analysis of the past and utopia as a projection into the future. Perhaps this was the start of my interest in myth, a form of man’s deepest knowledge of the past. I heard you mentioning the writer Josephine Hart who said: “Sometimes we need a map of the past. It helps us to understand the present and to plan for the future.” I think that’s one of the key concepts of psychoanalysis. In fact it is the metaphor of the map as a representation of man. Interesting in this regard Peace of 2003 in which the various parts of a globe are held together by a barbed wire. The broken world is held together by the violence of war. The second group of works that we are going to analyze here is related to migration, to the movements. A concept that is deeply connected to your personal experience. Let’s talk about the Baggage of Ulysses in 2003. In this work we are still very close to the concept of utopia. Landscapes that are created and destroyed according to the possible readings, surrounded by marble powder, extremely white and thin, a bright material that reflects light and which, in my opinion, is able to perfectly represent the area of thought. Ulysses also appears in another title, the Ulysses Syndrome of 2004. Perhaps it is the most autobiographical work I have ever done. Here I declare myself an immigrant with all her conflicts and anxieties. Each suitcase contains references, in one these are flowers, but with a series of knives towering above. These are the romantic illusions of youth, which are pierced and destroyed over the years, which is also a sexual metaphor for something penetrating and sharp. Another case contains a small house, nearby there is an axe, meaning the need to break with the past. The broken cups contained in another case are the shattered illusions. From another case words and phrases fall down, these are the expectations of everyone’s life. The stormy sea is the situation in which many times I still feel. My feeling sometimes as being overflown from life, has given rise to the urgency to communicate which is the basis of my work and it is perhaps its trigger. The emotions level is another very intense aspect of my work. I think that producing images helped me to defeat the demons of existence. Beyond the Pillars of Hercules is the work you made in 1998 at the Centro Cultural Recoleta in Buenos Aires. In that installation work I quoted a text of the Mayan culture, the Chilam Balam. It tells, in a very poetic way, how the natives saw the arrival of Europeans. It puts in connection the two worlds that are my reality. I used the ultramarine blue for this work, in its philological meaning. As in the Unknown Earth of 1997, realised in a private gallery always in the capital of Argentina. In 1995 I realized Restless Earth in Rome in the Spazioltre gallery. The floor was blue, like light. Everything was floating. I am interested in the concept of representation of the territory, which is basically an abstraction. We can talk about Towards Ithaca. This is a ship that remains aground. Sometimes in an intellectual pathway you can get caught in the daily life, here represented by any type of ordinary furniture of any home, that prevents people from taking flight. Even in A bolt from the blue you talk about everyday life. These are photos of sofas in a peaceful living room in a normal house. At a certain moment, an explosion destroys everything and the shards of glass stick to the sofa. In the installation on the floor, on the windows, I put a book on geopolitics, which has been very important for my training: The open veins in Latin America by Eduardo Galeano. It is a kind of link between the size of the domestic microcosm and the macrocosm in which we live, as you have had the opportunity yourself to state. Reflection on nature, on the environment is another important moment of your research. Shall we speak of the Sky at the end of the world? I have placed photographs taken from a video which I made while interviewing some inhabitants of Tierra del Fuego. I asked them how one feels to live in a situation of risk. I had previously tried to understand, talking to scientists, why such an environmental tragedy had happened precisely in a place like that, where there is little population and there are no industries. My idea was to highlight our responsibilities, the so-called developed world, vis-à-vis the rest of the world. Not only in the present but also in the future. The ozone hole is, in fact, produced by polluting gases that remain in the atmosphere for more than two hundred years. So the inhabitants of the land of the future will pay for our havoc. I would like to close our conversation talking about the work that you have presented in Rome in 2011, in the church of San Filippino, then in Buenos Aires in 2012 and later in the collective exhibition Nostalgia for the present, in Piacenza, in 2012 : Requiem terrae. It is a kind of prayer to the Earth that we are destroying. In fact, it is like the earth were dismantling itself. I like to treat it as something alive and sacred at the same time. In the Roman church the strong smell of the earth that I had sprinkled on the floor was really strong. The earth is fragile. We do not respect it, thinking only of temporary enrichment. The man as a big creator is able to destroy and here we resume the theme from which we started. Maria Nadotti in the preface to Les Feux de l’automne writes: “As it has happened to almost all important women artist- writers, painters, sculptors, musicians, and film-theater performers – even for Nemirovsky the biography is a point of access to work. Not only because when the artist is a woman, critics tend to reduce her to the existential dimension, going through the work looking through the peephole of a private happening. But because the best female artists have never separated work from life except through the powerful act of giving form. Just think of some famous names: Artemisa Gentileschi, Virginia Wolf, Frida Kahlo, Louise Bourgeois. I like to find here a reference to the work of Ines Fontenla where places, architecture, geopolitics pass each time from a physical dimension to an existential dimension, making anyway geography of the soul. In the “ Solomon’s House” the Bensalemites are doing scientific experiments realised with the Bacon’s method to control nature and apply knowledge to improve the society. J.Hart, Il danno, Feltrinelli, Milano, 1995; p.69. The exhibition was curated by the writer of this text at the Biffi Arte space. Inés Fontenla, born in Buenos Aires, Argentina, currently lives and works in Rome. She studied design and drawing at the Academies of Fine Arts in Buenos Aires, Madrid and Rome. 1979 – Advanced courses, the Academy of Fine Arts of Rome. 1989 – First prize, “Immaginaria 92”. 2011 – Roma – Chiesa di San Filippino – “Requiem Terrae” – organized by Lucrezia Cippitelli. 2009 – Roma – Studio Lovells – organized by Chiara Marzi. 2004 – Rome – Studio d’Arte Contemporanea P. Casagrande “Derive” (Driftings), organized by Angela Madesani. by Simoneta Lux and Domenico Scudero. 2002 – Genoa – Leonardi v-idea Gallery, “Alla fine delle utopie”, organized by Viana Conti. Milan – “La sfida di Aracne” – Nuova galleria Morone a cura di Angela Madesani. 2014 – Milan – “Una solitudine troppo rumorosa”- Nuovagalleriamorone – organized by Angela Madesani. 2012 – Piacenza – Galleria Biffi Arte – ” Nostalgia del presente” organized byAngela Madesani. 2011 – Buenos Aires (Argentina) – C. C. Borges – “+doc” organized by Lucrecia Vera Gaumont. 2010 – Berlino – Galleria artMbassy – “House warnig” organized byi Chiara Marzi. 2009 – Matera – Pallazo Monacchele – “birds of passage” organized by Federica La Paglia. Venezia, Isola della Certosa – ”Natura-snaturans” organized by Angela Madesani. 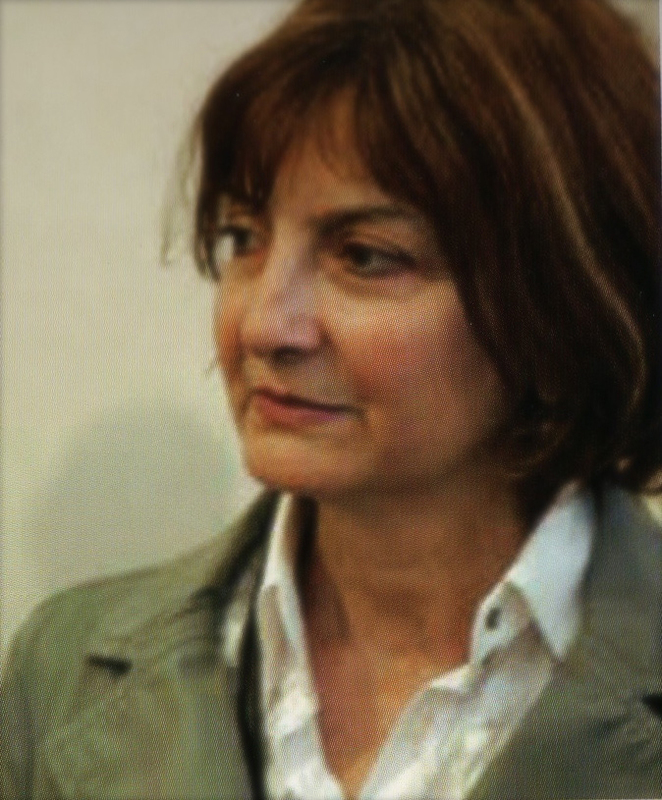 Taranto – Palazzo delli Ponti – “A sud del mondo” organized by Rosalba Branà. Genazzano (RM) – Centro Internazionale di Arte Contemporanea – Castello Colonna – “Memoria/Memorie” organized by Claudio Libero Pisani. “Proyecto Patagonia” ( Project Patagonia), organized by A. M. Batistozi. – Wisbaden- Bellevue-saal, “Ahnumung und gegenwart” organized by Ulrich Meyer – Husman. Buenos Aires – C. Borges, organized by Irma Arestizabal. – Madrid (Spagna) – Galleria Van Art. 1991 – Ferrara – Milan – Rome “Artae” organized by Achille Bonito Oliva. Roseto degli Abruzzi (TE) “Ottetto per pittura e scultura” a cura di Lorenzo Mango. 08.10 Urpflanze, La natura dell’idea.